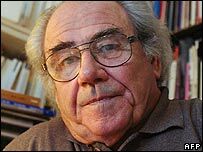 French sociologist and philosopher Jean Baudrillard has died aged 77 at his home in Paris following a long illness. Baudrillard, a leading post-modernist thinker, is perhaps best known for his concept of hyper-reality. He argued that spectacle is crucial in creating our view of events - things do not happen if they are not seen. He gained notoriety for his 1991 book The Gulf War Did Not Take Place and again a decade later for describing the 9/11 attacks as a "dark fantasy". Baudrillard focused his work on how our consciousness interacts with reality and fantasy, creating from them a copy world he called hyper-reality. He said that mass media led to hyper-reality becoming a dominant force in today's world - an argument taken to a provocative extreme in his statement that the 1991 Gulf War primarily took place on a symbolic level. Since little was changed politically in Iraq after the conflict, all the sound and fury signified little, he argued. In his essay The Spirit of Terrorism: Requiem for the Twin Towers, he caused controversy again by describing the 9/11 attacks as a fusion of history, symbolism and dark fantasy, "the mother of all events". While terrorists had committed the atrocity, he wrote: "It is we who have wanted it. Terrorism is immoral, and it responds to a globalisation that is itself immoral." Born in Rheims into a peasant family, he studied German at the Sorbonne, later working as a teacher and translator. He taught sociology throughout the 1960s. He was a prolific writer, penning more than 50 works including: Simulacra and Simulation (1981), America (1986), and The Spirit of Terrorism: An Requiem for the Twin Towers (2002).